Bioactive Tetra Peptides Activates Collagen production and decreases appearance of fine lines, wrinkles and skins overall roughness. Advanced Matrixyl Synthe 6 Powerful anti-aging peptide that reduces the appearance of fine lines and wrinkles for long-lasting results. Collagenetics is a miracle break- through, total face and body skin care system. 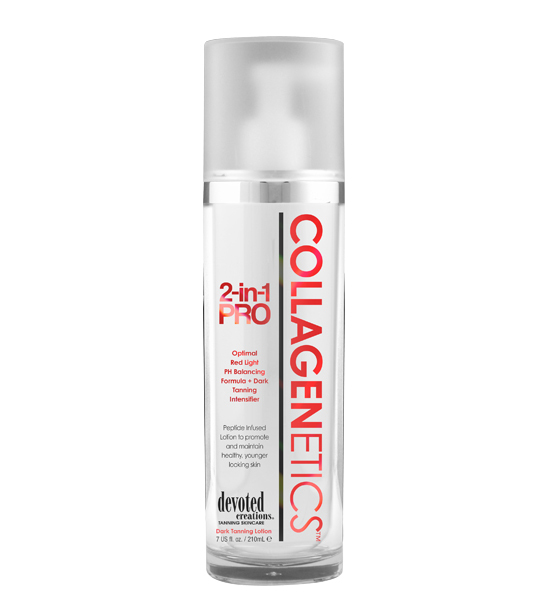 COLLAGENETICS 2-IN-1 LOTION PRO is the newest product to this innovative regime. 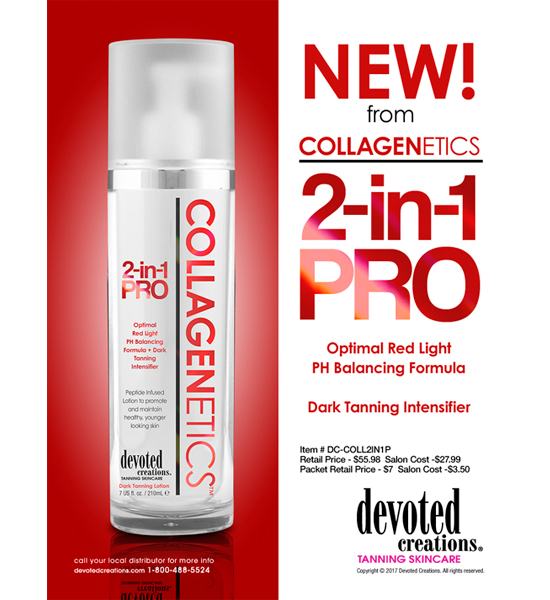 The 2-in-1 PRO has been formulated for those tanners who have chosen to utilize both the red light therapy and tanning in the same day, but still want the highly concentrated skin care ingredients Devoted Creations in known for. With one product you can do it all! Apply the lotion to your entire body following exfoliation and prior to Red Light Therapy or your tanning session. Your skin will be prepped for your red light session and then ready to get fast, dark tanning results without the need to apply a separate product. Our innovative Collagenetics 2 in 1 PRO has been scientifically designed to work in conjunction with our collagenticts line, or with use alone, to help erase the appearance of aging and restore your skins youthful look. 2 in 1 Pro will provide optimum Red light and tanning results as well as help to reduce the appearance of fine lines, wrinkles, and signs of aging, and boost collagen production.